Melissa Trinidad has been a health coach and health educator for more than 10 years. Her blog provides sound health and nutrition information and plant-based recipes that are easy and delicious. Trinidad holds a certificate in plant-based nutrition from eCornell University and earned her Master of Science from Cal Poly State University. If you crave a sweet, cool and healthy treat, grab a smoothie. Smoothie shops like the familiar Jamba Juice and Robeks are ubiquitous these days, and for good reason. 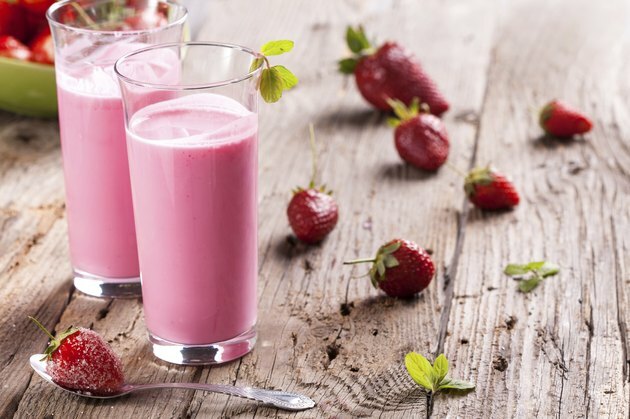 Smoothies are delicious, and many people even eat them in place of a traditional meal. But whether these blended beauties any better than eating the same foods in solid form is open for discussion. When looking at whether it is healthier to eat a smoothie or solid food, look at what you are eating. Many purchased smoothies are very high in sugar from sorbet, frozen yogurt or fruit juice. Consider avoiding this extra sugar and choose an "all fruit" or "fruit and vegetable" smoothie. These typically do not include sorbet, frozen yogurt, dairy or soy. Green smoothies provide a substantial nutritional boost. If you are not likely to eat raw greens in solid form, add some nutrient-rich raw greens like spinach or kale to a smoothie at home, or make the request at your local smoothie bar. The research available on whether drinking caloric liquids leads to consuming more calories is considered to be inconclusive. But smoothies are not a liquid, even though you drink them with a straw. The reason is fiber. When an item is juiced, all of the pulp, or fiber, is removed and only the liquid is left behind. When the whole food is blended, the fiber remains. The food is merely broken down into much smaller pieces. One of the advantages of solid foods over smoothies is that they take longer to consume, especially if you take the time to chew them completely. This allows more time for your brain to receive the message from your stomach that you are full, before you overeat. Smoothies have several benefits over their solid forms. Your body can absorb the nutrients in a smoothie more easily because blending helps break down hard-to-digest plant cell walls. This is very difficult to do with solid foods, unless you chew each bite until it reaches liquid form. Breaking down these cell walls is also vital for allowing the chemicals inside the cells and within the cell walls to mix and create various chemical reactions. One result is the creation of isothiocyanates, which have powerful anti-cancer properties and have been shown to inhibit tumor and cancer growth. Cancer-fighting and preventing isothiocyanates can be found abundantly in foods like kale, broccoli and cabbage, so be sure to add some greens to your smoothie. Drinking a smoothie can potentially be better than eating solids if your smoothie is full of delicious and health-promoting fruits and vegetables You can also add healthier items like kale or flaxseed meal that you may not otherwise eat in the solid form. Try making your own green smoothie at home. Add to your blender pitcher 1/2 cup apple juice, one orange, one ripe banana (preferably frozen), one cup frozen blueberries, and two packed cups of kale or spinach. Blend thoroughly and sip slowly.